Thank you for donating to the Cardinal’s Appeal. Select the “gift amount”. The gift amount is the amount you will be charged monthly. Select “Recurring Gift” as gift type and select a gift duration. Select the “gift amount.” Select “Recurring Gift” as gift type and "Ongoing Monthly" as the gift duration. Please note a one time gift can’t be used to make a payment on an existing pledge. 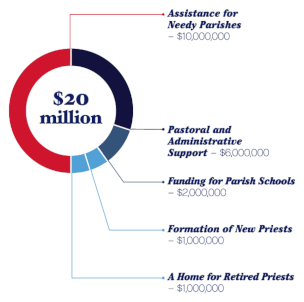 To make a payment towards your existing pledge, please contact our office at 646.794.3300 or email cardinals.appeal@archny.org. Recurring Gift - Please charge my credit card this amount each month. I don't have a parish.